This is one of the first recipes that I have ever made-up on my own, so I’ll admit that I had my fingers crossed hoping all day that it would be good! And it wassssssssss!!! With this one, remember… just because it’s “vegetarian” (if you use two cream of celerys) that doesn’t mean we should super-chow on it. Eat when you’re hungry… until you are satisfied. Then stop. I’d even recommend serving yourself a bowl/plate of it and then immediately putting the rest of it in tupperware and in the fridge. Maybe make yourself a fruit salad to go with it… eat half of the fruit salad ahead of time and then the other half, if you are still hungry, after you finish the enchilada bake. Not trying to be preachy… more so just reminding myself of this for the next time I pull up this recipe to make! It’s always a good reminder for me of how to move away from gluttony! In a large bowl combine: cream of chicken, cream of celery, green chiles, sour cream, hot sauce, and cumin. 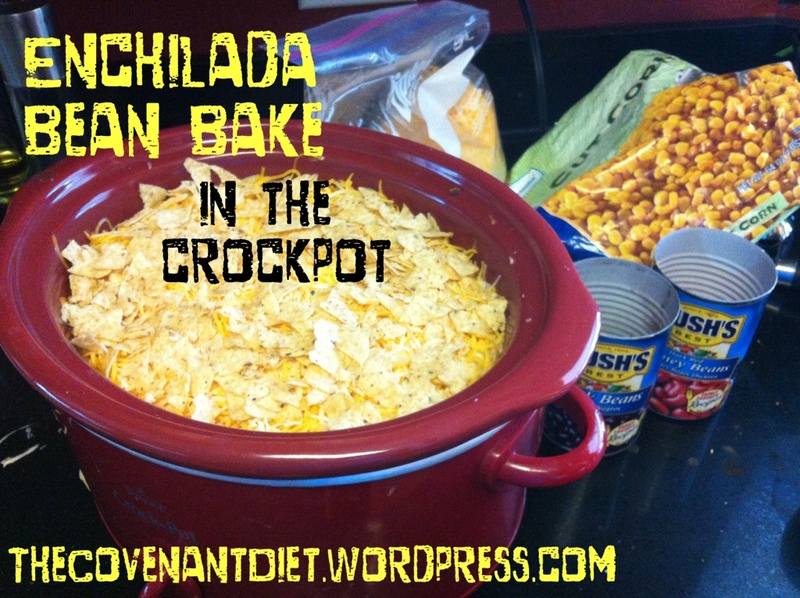 Crush a few handfuls of tortilla chips and spread over the bottom of the crock pot. Grab a handful of the verrrrry cold corn and “sprinkle” it on top of the crushed chips. Place a layer of black beans and kidney beans. Spread a layer of the soup mixture. Over the soup mixture, place a layer of shredded cheese. End with a layer of chips. *Here you have the “easy/convenient” version, but you could totally make your own cream of chicken/celery, make your own tortilla chips, use fresh chopped green chiles, fresh corn, and cook your own black beans and kidney beans. Honestly, I hope to be able to do that someday but I’m not much of a cook, I don’t really enjoy cooking as some do, and I’m not good enough of a time manager to do all that with my toddler and preschooler with me! 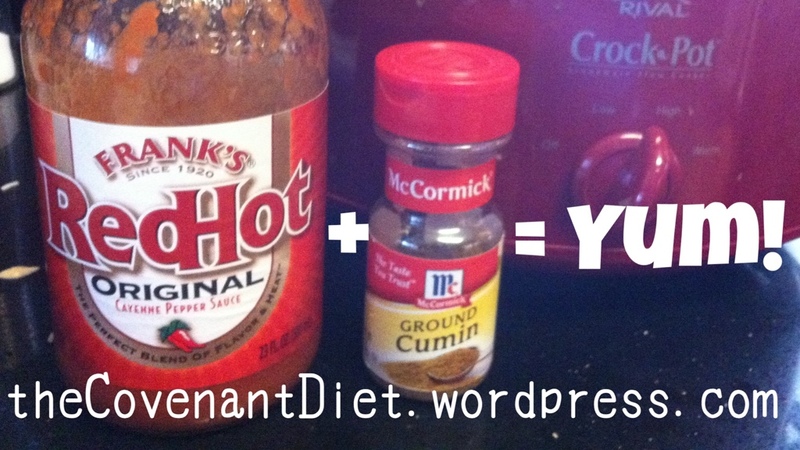 And a quick shout out to this flavor combo… Frank’s Red Hot Sauce with ground cumin is uh.maz.ing. I use it in our black bean soup (which is double uh.maz.ing.) and now I use it in anything Mexicanish.